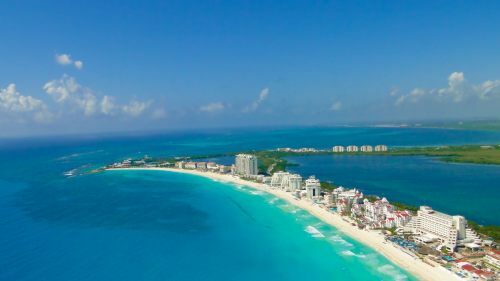 Interjet has dropped the price of their non-stop flights from Vancouver to Cancun, Mexico down to between $249 and $276 CAD roundtrip including taxes. If you're comfortable booking in Spanish, you can book these flights for $249 CAD roundtrip. 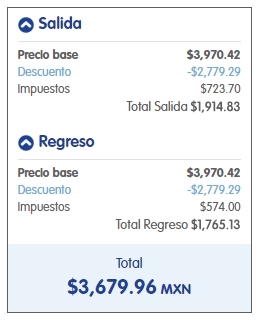 The price should show up as $3,679 pesos for a roundtrip flight. If not, you can click on 'Visualiza todo el mes' to open up the calendar view and look for the date combinations that add up to around $3,679 pesos roundtrip. When booked with a Canadian credit card, $3,679 pesos will work out to $249 CAD roundtrip based on today's exchange rate, and including the typical credit card foreign exchange fee. 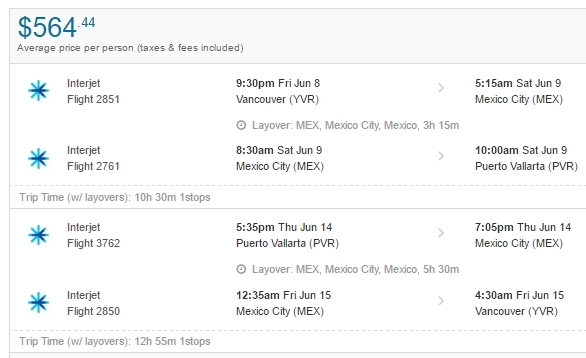 5 Responses to "Vancouver to Cancun, Mexico - $249 to $276 CAD roundtrip including taxes | non-stop flights "
When does Interjet fly to Puerto Vallarta, as I was unable to click PV as a place to fly to from YVR. We want to travel end of February to mid-March approximately for ten days. John: You may need to use a third party booking site to find Interjet fares from Vancouver to Puerto Vallarta. The Interjet website only allows you to book the non-stop destinations from Vancouver (Mexico City and Cancun). I've seen Interjet fares to other destinations, connecting in Mexico City each way, on sites like Flighthub. But I haven't seen any Interjet fares to Puerto Vallarta that I would consider a good deal. I can't find those deals.Sept.30-Oct 4 to Cancun. I tried right after I got your email. 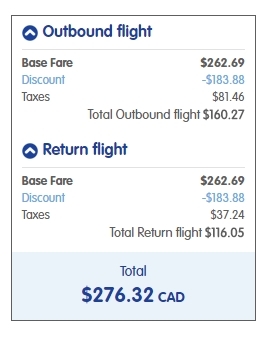 Chris, I've tried many different combinations on the interjet website and still keep getting airfare between $400-550 CAD roundtrip. Are the prices you originally posted still offered? The date on the blog post is January 16th so I'm guessing these are long gone.